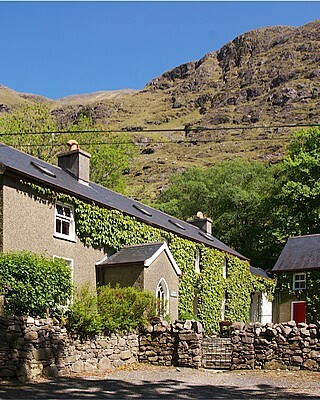 A charming L-shaped terrace of four two-bedroom holiday cottages derives from an attractive conversion of the old “keeper’s house” and the adjacent Delphi Boathouses. With old pine furniture, large open fireplaces and stone floors downstairs, these fine old houses have a charming air of tradition and cosiness. But they also have all the requirements of modern living including a well-equipped kitchen, comprehensive heating, a shower and a bathtub, comfortable sofas & chairs, a large airing cupboard and full carpeting upstairs. Two of the Boathouse cottages sleep up to five people with a triple room (double bed and single) and a twin room (two single beds). The other two Boathouse Cottages are a little smaller and sleep up to four people in a double room and a twin room. Electricity and oil is metered separately. Cottages No.1 & No.2 sleep up to 5 people with a triple room (double bed & single) and a twin room (two single beds). Cottages No.3 & No.4 are a little smaller and sleep up to 4 people in a double room and a twin room.